Everyone is familiar with Dwayne ‘The Rock’ Johnson. Those who do not know him as a film superstar will remember him as one of the most popular wrestlers in the 90s. His life has been in public view, a direct result of his extreme popularity. This has naturally spilled to other members of his family, such as his daughter, Simone Alexandra Johnson, who is the first daughter of the Wrestling icon and Hollywood superstar. Simone Alexandra’s primary claim to fame might be through her father at the moment, but she is well on her way to creating a legacy of her own. She is a model who aspires to follow in the footstep of her father and become a wrestling star. Here is a quick look at her life and career thus far. Without a doubt, being born to a mega-rich famous film star isn’t the worst way to begin one’s life on earth. 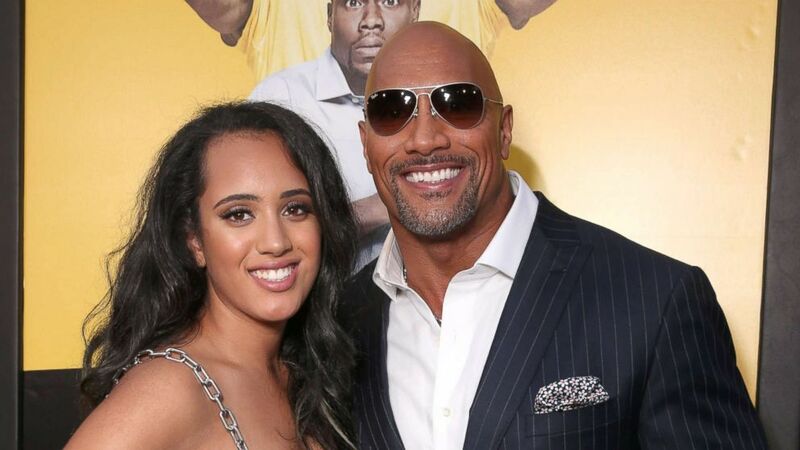 Simone Alexandra Johnson got to enjoy the coveted status on the 14th of August, 2001 when she was born to her father, Dwayne Johnson and her mother, Dwayne Johnson’s wife at the time, Dany Garcia in Davie, Florida. While her father is notably known as a wrestling icon and film star, her mother, Dany Garcia is a producer and owner of The Garcia Companies which is focused on media management. Her parents were together for 10 years before their divorce in 2008. As the daughter of a high-profile celebrity, details about her education has been kept away from the media for security reasons but we know that she has graduated high school. While her education has been kept out of the press’s reach, her budding career has been enjoying significant publicity. Being the daughter of one of the most beautiful men in the country, Simone naturally inherited the good genes of her parents and as such became a worthy candidate for a modeling career. She has put this good use by signing with one of the biggest modeling agencies in the world, IMG Models. She has developed an Instagram modeling image that has seen her acquire over 300 hundred thousand followers. Her carriage and fashion knowledge have also helped her become an ambassador of the Golden Globe Awards, a feat that made her the first person to hold the role. Being born into a family of wrestlers has seen to Simone Alexandra Johnson following in the family business and pursuing an interest in wrestling. Her grandfather, Rocky Johnson was a wrestler and her great-grandfather, Peter Maivia was a wrestler too among a couple other uncles and aunts. According to her father in an interview in 2018, Simone plans to become a WWE Wrestler and she already has the support of her father and her grandmother, Ata Johnson. While the options are wide for Simone with guaranteed support from family members, she still intends to complete her education and she wants to do so by earning a business degree in college. As mentioned earlier, her mother, Dany Garcia is the owner of a media management company while her father is well… The Rock. Her mother, since the divorce from her father in 2008 has been married to Dave Rienzi, who is a former personal trainer of Dwayne Johnson. Her father, on the other hand, has been in a relationship with Lauren Hashian, who is a singer and although they haven’t gotten married, they have two children – two daughters, Jasmine Johnson who was born in December 2015 and Tianna Gia Johnson who was born in April 2018. Simone might be the only biological child of her parents, but she has an extensive and close family that includes her step-siblings and extended family members from her father’s Samoan side. She is also very close to her father whom she often accompanies to red carpet events. If there is one thing that most certainly sets The Rock apart from other global film stars, it is his physical profile. His background in wrestling has enabled him to build a profile that is so unique and makes him recognizable anywhere in the world. With Simone Alexandra Johnson’s intentions to become a wrestler, she will have to achieve a similar physical uniqueness. At the moment, she stands at a height of 5 feet and 10 inches. Her other notable features include golden brown eyes and dark hair.